Our detox formula was specifically designed to compliment our Thinco Diet Capsules. Combine these therapeutic strength, 100% natural detox tablets with your Thinco Diet Capsules to enhance your health and wellbeing by detoxifying your liver, kidneys & digestive system, while increasing your vitality and losing weight! Keep the health kick strong! 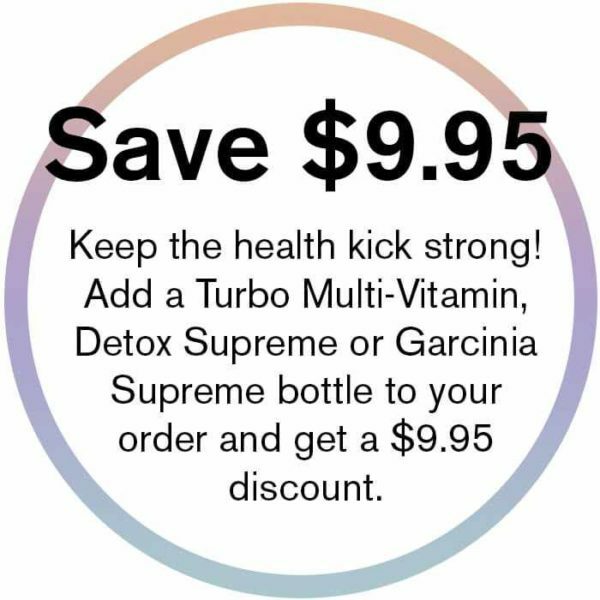 Add a Turbo Multi-Vitamin, Detox Supreme or Garcinia Supreme bottle to your order and get a $9.95 discount! Detox and control weight, naturally! Premium quality, hormone free soft gel capsules target stored stubborn fat (adipose fat) which is the hardest fat to shift; hips, thighs, belly, that most diets fail on. Eat real food. This Detox Supplement contains powerful antioxidants and potent adaptogens and was designed to compliment our Thinco Diet Capsules because of its therapeutic strength. Our 100% natural detox formula is created from a combination of Globe Artichoke, Milk Thistle and Shisandra Chinensis plus much more. This formula is designed to detoxify your liver, kidneys & digestive system, while increasing your vitality and enhancing weight control. Dosage: Very Low Calorie Program: One capsule daily 10 minutes before a protein meal. Active Plan/Plan 1000: One capsule twice daily 10 minutes before a protein meal.